Friday July 31st 1925 Did some sewing in AM. Had letter from Millie Byington. Laura & Edith home from Havana. Mr Albers took us to Cemetery after supper. 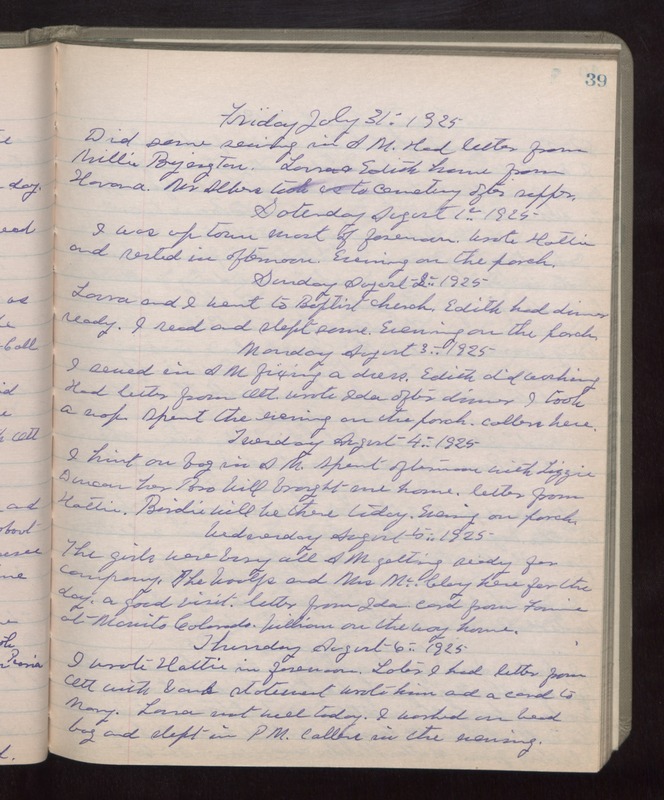 Saturday August 1st 1925 I was up town most of forenoon. Wrote Hattie and rested in afternoon. Evening on the porch. Sunday August 2nd 1925 Laura and I went to Baptist Church. Edith had dinner ready. I read and slept some. Evening on the porch. Monday August 3rd 1925 I sewed in AM fixing a dress. Edith did washing. Had letter from Ott. Wrote Ida after dinner. I took a nap. Spent the evening on the porch. Callers here. Tuesday August 4th 1925 I knit on bag in AM. Spent afternoon with Lizzie Duncan her Bro Will brought me home. Letter from Hattie. Birdie will be here today. Evening on porch. Wednesday August 5th 1925 The girls were busy all AM getting ready for company. The Woolfs and Mrs McClery here for the day. A good visit. Letter from Ida, card for Fannie at Manito Colorado. William on the way home. Thursday August 6th 1925 I wrote Hattie in forenoon. Later I had letter from Ott with bank statement. Wrote him and a card to Mary. Laura not well today. I worked on bead bag and slept in PM. Callers in the evening.